During the Adult Education and Family Literacy Week (AEFL Week), we have been promoting the value of and the need for adult education in the U.S. 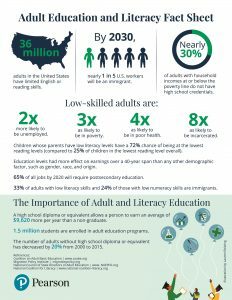 Advancing adult education and English language acquisition benefits not only individuals and their families but also their communities and the nation’s economy. By offering educational opportunities to adults, we help them achieve economic independence and social mobility. But advocating for adult education should not be limited to just one week a year. It is important that we bring awareness about the need for adult education every day. Below is a list of resources for anyone who wants to get involved in advocating for adult education and family literacy. COABE/NCSDAE Educate & Elevate Campaign – A national campaign to help policy makers understand the value of Adult Education. The website offers a helpful toolkit for organizations and individuals who want to get involved in the campaign. National Coalition for Literacy – a national coalition of the national organizations and other advocates dedicated to advancing adult education, family literacy, and English language acquisition in the U.S.
Project Literacy – a global campaign founded and convened by Pearson that aims to end illiteracy by 2030 through partnership and action. 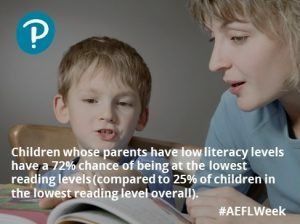 “Low literacy has a major impact on income inequality and parenting.” Read this AEFL Week Fact Sheet from the National Coalition for Literacy. The World Education’s blog The Well – interesting posts on the topic of Adult Education, including ESOL. Adult English language instruction in the United States: Determining need and investing wisely. An article from the Migration Policy Institute. According to American Community Survey (ACS) data from 2015, there are approximately 43 million immigrants in the U.S., which accounts for about 13.5 percent of the total U.S. population (321.4 million in 2015).i Furthermore, according to the Current Population Survey (CPS) from 2016, immigrants and their U.S.-born children totaled approximately 84.3 million people—27 percent of the overall U.S. population. 15 percent in production and transportation business. The top five states with the highest immigration population were California (10.7 million), Texas (4.7 million), New York (4.5 million), Florida (4.1 million), and New Jersey (2 million). Demographically, approximately 51 percent of immigrants in 2015 were women. Immigrants were also older than the native-born population—the median age of immigrants was about 44 years in 2015, whereas the median age for the native-born population was 36. In 2015, there were nearly 26 million individuals in need of English Literacy. ii These individuals are classified as Limited English Proficient (LEP) and represent 9 percent of the total U.S. population ages 5 or older. Out of that number, nearly 5 million LEP individuals are native-born and 21 million are foreign-born. The 21-million number represents approximately 49 percent of the 43 million immigrants ages 5 and older who were LEP. Spanish speakers accounted for 64 percent (16.4 million) of the LEP population, Chinese speakers accounted for 7 percent (1.8 million), and Vietnamese accounted for 3 percent (867,000). The states with the highest share of LEP residents were California (19%), Texas (14%), New York (14%), Hawaii (12%), Nevada (12%), New Jersey (12%), and Florida (12%). The overwhelming majority (75%) of LEP individuals were adults between ages 18 and 64. About 16 percent of LEP individuals were adults 65 and over. LEP children constituted 9 percent of the total LEP population. In general, LEP individuals were less educated than English-proficient individuals. Forty-five percent of LEP adults 25 years old and older did not possess a high school diploma (compared to 9 percent of English-proficient adults). Only about 15 percent of LEP adults had a college diploma (bachelor’s degree or higher), compared to 32 percent of English-proficient individuals. According to the 2015 data, 1.5 million adults were enrolled in adult education programs.iii Out of the 1.5 million, 44 percent of adult students were English Language Learners (ELLs). These numbers indicate that only a fraction of LEP adults are served by adult education programs, and most states have waiting lists because of limited funding. Learning English is not an easy task for adults, especially those with low literacy skills in their native languages. 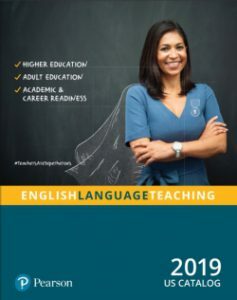 Research shows that adult learners need between 85 and 150 study hours per year for six years in order to gain full English proficiency.vi NRS data indicate that on average, adult ELLs spent 190 hours per year, but two-thirds of them completed only one full level of education. Approximately 40 percent of ELLs completed more than one full level of education.vii What is important to note, however, that the levels most completed by ELLs are the beginning and intermediate levels (NRS Beginning ESL-Literacy–NRS Low-Intermediate ESL). ELLs at these proficiency levels do not have sufficient skills for successful transition into post-secondary education. The importance of English literacy programs cannot be overstated. Since LEP individuals are more likely to live in poverty than their English-proficient counterparts (in 2015, about 23 percent of LEP individuals lived below the official federal poverty line compared to 13 percent of English-proficient individuals),viii adult education and family literacy programs are crucial to help these individuals improve their lives by giving them skills they need to succeed in a career, post-secondary training, family life, and society. Lowers use of public benefits. Allows adults to obtain more specialized training or pursue college education. Helps immigrants obtain citizenship and engage in all aspects of civic and community life. 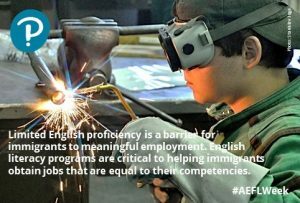 Advancing adult education and English language acquisition benefits not only immigrants and their families but also their communities and the nation’s economy. By offering educational opportunities to adults, we help them achieve economic independence and social mobility. A number of organizations are involved in advocating for adult education in the U.S. If you are interested in promoting the value and benefits of adult education and English language learning, explore the sites listed below and get engaged! COABE/NCSDAE Educate & Elevate Campaign – A national campaign to help policy makers understand the value of Adult Education. The Educate & Elevate website offers a helpful toolkit for organizations and individuals who want to get involved in the campaign. National Coalition for Literacy – A coalition of national organizations and other advocates dedicated to advancing adult education, family literacy, and English language acquisition in the U.S.
vi McHugh, Gelatt, & Fix (2007). Adult English language instruction in the United States: Determining need and investing wisely. Washington, DC: Migration Policy Institute. Adult English literacy programs are crucial in helping adults with limited English proficiency improve their lives by giving them skills they need to succeed in a career, post-secondary training, family life, and society. The population of English Language Learners (ELLs) attending English language courses is very diverse, representing adults from many different cultures, languages, educational backgrounds, and socio-economic and life situations. In today’s post, we are featuring adults who have overcome challenges and reached their life and educational goals. Their stories are truly inspirational and show how adult education impacts the lives of so many adults. Enki Bello. Originally from Colombia, Enki began her studies in the USA in 2010 at Bergen Community College’s (BCC) ESL program located in Hackensack, NJ. “She just needed a few fixes on her grammar, vocab and writing skills. Her love of learning and a strong positive attitude towards reaching her lifelong goals were clear,” says Instructor, Kathleen Cronin. “I suggested to her that she should look into connecting with the College’s theater program as she often wrote and presented in class about her passion for music and her experiences as a Latina musician.” After working on her English skills, Enki enrolled into BCC’s Associate degree program and pursued a major in Music Business. In 2013, Enki graduated from BCC and transferred to William Paterson University. Thereafter, she continued studying towards her Bachelor’s degree in Popular Music Studies, which prepared her for a career in music. You can read more about Enki’s musical journey here. Just o Elio Crespo Valladares arrived in the United States in February 2016. He learned about the CARIBE Refugee Program through one of the orientations in Lutheran Services of Florida. He immediately attended school to improve his English skills. He came to the United States with a degree in education and wanted to pursue his career as a teacher. He attended school for 3 months. Immediately after completing the ESOL program, he applied to volunteer for CARIBE as a teacher’s assistant. He tutored struggling students at the Foundations level. While volunteering, he got employed by the University of Tampa as an event coordinator and by World Financial Group as a financial advisor/broker. He really wanted to pursue his educational career so he sought the help of the CARIBE Program in getting his credentials translated and evaluated. He submitted his application to the Florida Board of Education. 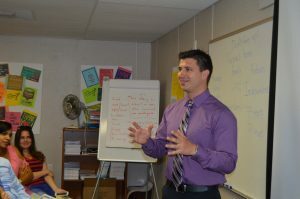 In a month, he received his Certificate of Eligibility to become a certified teacher in the state of Florida. He immediately applied for a teaching position for Hillsborough County Public Schools Adult Education. Justo is now happily working as a part-time adult ESOL teacher in the CARIBE Refugee Program. He started the new class offerings at CARIBE First Baptist Church in March 2017. Jose Ciro Gomez arrived in the United States in March of 2016. He was an English in his home country. He heard about the CARIBE Refugee Program from one of the orientations at Lutheran Services of Florida. He immediately started attending school to polish his English skills. His teacher, Maria Fernandez, noticed how good he was. When she found out that he has an education background, she immediately recommended him to volunteer for the CARIBE Refugee Program. While waiting for his volunteer application to be approved, he helped teachers at CARIBE Lois: He tutored struggling students and took over classes when a teacher was called for a meeting. Ciro continued to attend school for 6 months. He finally landed a job at GNC as a store clerk. While working at GNC, he continued to volunteer for CARIBE. During the opening of the Fall Semester 2016, a teaching position opened at CARIBE. He immediately applied for the job. His interview demonstrated his skills and determination. Ciro did well and was hired by CARIBE in August 2016 as a part-time adult ESOL teacher. While working for CARIBE, Ciro has demonstrated hard work and excellence. 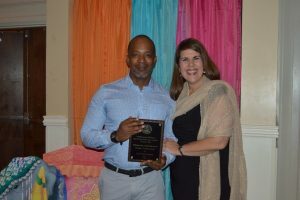 He has earned the respect of his colleagues and was awarded the Adult Education Rookie Teacher of the Year 2017 at the HTCAA Awards Banquet. The CARIBE Refugee Program could not be any prouder of Ciro’s accomplishments. His story shows that anything is possible with hard work and dedication. Martin M. and his father both came to CARIBE at the same time early in the Fall Semester. They stayed with relatives at the time. They successfully finished their semester with Luis Cardenas as their College and Career Readiness ESOL teacher. They were later joined by Martin’s mother who is now attending ESOL classes. All three of them are enrolled in A+ Certification Preparation course at Adult Ed and are now living on their own. They have started to establish their lives in Tampa, and they just bought a car! Manuel Penalver Tadeo. Manuel Penalver Tadeo’s story is a true story of perseverance and success. Manuel Penalver first arrived in the country in November 2013. He was a refugee from Cuba. After getting his social security card, he immediately signed up for ESOL classes with the CARIBE Refugee Program. Manuel already has some knowledge of the English language, having lived in Spain for a few years. Manuel has a high level of literacy as he completed his bachelor’s degree in Microbiology in Cuba. It did not take long for him to complete level 7 of ESOL. Manuel knew then that his hard work was just starting. After completing ESOL, he immediately signed up for the Laboratory Medical Technician Program at Erwin Technical College. With the help of the CARIBE Refugee Program, Adult and Community Services Center, Federal Student Aide (FAFSA) and Hillsborough County Social Services, he was able to pay for the entire Laboratory Medical Technician Program. While going to Erwin Technical College, he was hired by the CARIBE Refuge Program as a part-time paraprofessional. This helped pay for his everyday living expenses and buy a used car. He was able to complete the Laboratory Medical Technician Program at the shortest time possible while earning high grades in all his courses. Osmany C. from Cuba was enrolled with CARIBE at Lois and took CASAS test on 9/20/16.He asked for a voucher to attend GED classes and started the GED preparation program in September 2016. In December, he took his exams and passed all subject areas! His counselor, Mireya Cox, suggested he should apply for an A+ Certification course at Erwin Technical College. CARIBE will continue to support Osmany by referring him to the Hillsborough County Social Services at the Hillsborough County Schools Adult Career Service Center to help with the cost of tuition for the A+ Certification. Kirenia A. is a student that came from Cuba in October 2016. When she first came to class, she was very quiet and shy and refused to participate in oral activities. As the days went by, Kirenia shared that she had had a very bad experience with an English teacher in her country. Her teacher got very upset with the students when they made mistakes. Because of her teacher, she stopped participating in class and was afraid of speaking English to other people. After some time at CARIBE, Kirenia realized that her classmates made mistakes but did not feel uncomfortable. So she understood that the English teacher was caring and helping the students, and that the classroom was a safe environment for her to learn. All of the sudden, Kirenia was participating actively in class and finally gained self-confidence and lost her fear of making mistakes. Kirenia is studying English every day at home and is a very dedicated student. Whenever she has the opportunity, she speaks English. When people offer her help in Spanish, she declines it because she says that she needs to practice English as much as possible. Now Kirenia is able to go everywhere and speak English with anyone with no fear. Meeting the 24 year-old Cuban Darlin Guerra Diaz might give you the impression that she is all smiles, but underneath that facade there is this strong-willed and determined student who has always had her eyes and mind set on one target — becoming a doctor. 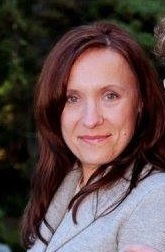 The elder of two siblings, Guerra is the daughter of Sonia and Roberto. Born and raised in Matanzas, Cuba, her parents worked very hard to give their children decent conditions and good education. Darlin loved spending time with her grandmother, and when she got sick, Guerra was by her side day and night, taking care of her. This experience led her to pursue her interest in the field of medicine. Although her mother is an experienced dental hygienist and her father a well-seasoned English teacher, they haven’t been able to continue working in their respective fields for many reasons. Cultural shock, language barrier, and other unfortunate personal and family events have emotionally crippled her family. Darlin has had to steer the wheel for the entire family to support them financially. She drove her parents to work and school, she attended her younger brother’s PTA meetings, and she got up every day at 4:30 a.m. to go to work. After her shift, she would drive miles to attend school. It was a huge sacrifice on her part, but it didn’t decrease her perseverance and determination. When in class, she would always find time to help her colleagues, making lots of friends along the way. Her unwavering desire to learn and pursue her dreams paid off when she got accepted into a local community college to continue studying medicine. She is over the moon. In her own words, “I struggled, worked my fingers to the bone, and studied hard. I believed in my dream when it seemed like a far-fetched reality. I’m so glad I didn’t give up.” I hope her story serves as an inspiration to other refugees and immigrants like her. It has been a sincere pleasure to be the one to share it. Pearson ELT would like to thank Scott Cohen, Manager, Curriculum and Instruction at Bergen Community College at Hackensack, NJ; and Ronald Allan Cruz, the Coordinator of the CARIBE Refugee Program in Tampa, FL for generously allowing us to share their students’ success stories. How many of you can raise your hand if I ask you about the 2012 PIAAC report? How many of you understand its implications? Interestingly, as I talk to adult educators around the nation, many, if not most, tell me they have never heard of PIAAC. Even many who say they heard of the report are uncomfortable articulating reasons why this study has serious implications for the practice of adult education. So, what is PIAAC? Released in October 2013 by the Organization for Economic Cooperation and Development (OECD) for its member nations, the Program for the International Assessment of Adult Competencies (PIAAC) is a cyclical study of the literacy, numeracy, reading, and problem-solving competencies of adults 16 to 65 in the USA and 22 other countries. Many of the comparison countries are among the twenty largest economies in the world. Adults in the United States underperformed most of their counterparts in literacy, numeracy, and problem solving in technology-rich environments. The USA ranked 13 out of 24 countries in English language skills, 19 out of 24 in numeracy, and 15 in problem solving skills. Over 36 million adults in the US have low literacy skills and fully one out every three adults have weak numeracy compared with the average across countries of one out of every five adults surveyed. Low level skills are distributed throughout different demographics in the USA, so that not only we have a larger percentage of adults with low skills but also a smaller proportion of the adult population has skills at the higher levels. When racial and ethnic variables are considered, minorities are over-represented among those with low competencies; 43 percent of Hispanics and over 30 percent of Blacks score at the lowest levels of literacy used in the PIAAC study. When confronted with the dismal findings, many critics will counter that it is unfair to compare adults in the United States with counterparts in smaller nations or in countries with different or more homogeneous demographics. However, one reason to be concerned is that the study compares our performance with that of adults in the other developed countries of the OECD, that is, the countries with which we compete for a slice of the global jobs pie. According to the PIAAC study, while adults in the USA have a higher rate of participation in adult education and training than adults in other countries, those who need the training the most are the least likely to get it. Those of us working as administrators in adult education and literacy need to evaluate our programs; those of us who teach need to take a careful look at the teaching learning interaction in our classrooms, and those of us who focus on professional development must assess our training programs in order to determine why, in spite of the higher participation rate in education programs, our adults not only perform below average internationally but also show that we are getting worse instead of better over the last two decades. It is also worth considering that the United States is not doing as well as other countries educating our youth; a separate OECD report on the skills of in-school 15 year olds (PISA, 2012) shows our young students scoring below their international counterparts in literacy and numeracy. The challenge is that while other countries have been able to address the skills gap of previous generations, youth in the United States don’t perform better, and often underperform their parents and grandparents. It should be apparent now why I find it perplexing that so few in our field have taken the time to learn about this study. I think that understanding the implications of the PIAAC study is a must for to educators and policymakers alike. We know of the challenges our students with low literacy levels face obtain employment and to succeed in other personal or training endeavors. It is noteworthy that according to the report, the United States has one of the highest percentages of available jobs requiring skills at a high school level or above. In other words, while most jobs in demand in this country require higher literacy skills, our adult population has lower skills than the countries we compete with. So, what are we to do with this knowledge? It seems to me that our first gut-reaction should be to acknowledge loudly that what we have been doing in adult education is not working. We need to rethink literacy education and very purposefully integrate numeracy and technology-enabled problem solving in all our adult education programs. And beyond that, we need to see the PIAAC report as a call to action and we should respond each within our purview because only collective action will address the massive challenges. Adult educators must be proactive and sit at the table as solutions for the problem in K-12 are considered because the literacy crisis affecting our adults is made worse by an ongoing flow of under-skilled youth. To access the study for the United States click here. 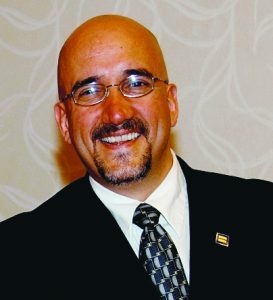 Federico Salas-Isnardi has 30 years of experience in Adult Education and second language acquisition. He has conducted hundreds of workshops on many aspects of adult education, literacy, and ESL and has focused on intercultural and diversity training as well as social justice issues affecting students and teachers for over 25 years. Federico served on the team that developed the US Naturalization test and is one of the authors of Future US Citizens and a consultant to the Future English for Results series. Adult Education and Family Literacy Week from Pearson ELT on Vimeo. September 24-30 is the Adult Education and Family Literacy Week (AEFL Week). In support of the AEFL Week, we are posting articles, stories, and resources on this blog and our social media platforms– Facebook and Twitter (@PearsonELTUSA). 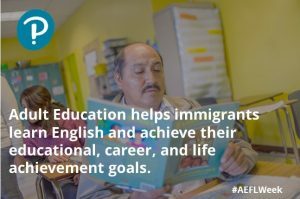 Advancing adult education and English language acquisition benefits immigrants and their families as well as their communities and the nation’s economy. By offering educational opportunities to adults, we help them achieve economic independence and social mobility.